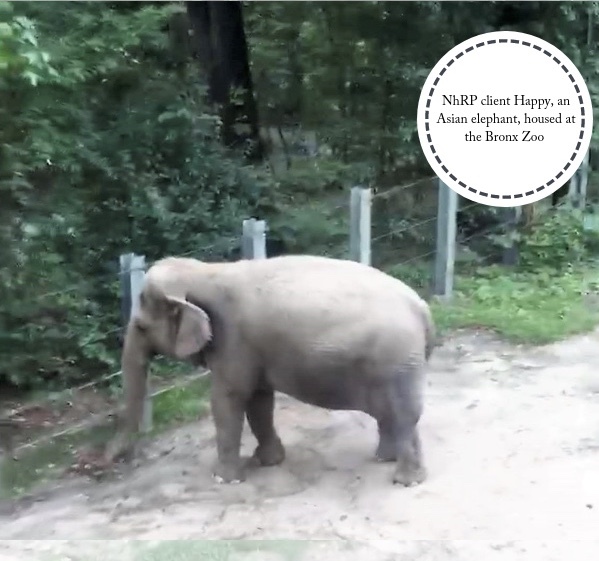 (CN) – Fighting to end the 41-year captivity at the Bronx Zoo of an Asian elephant named Happy, a nonprofit says the legal battle it started has been languishing in a court west of Rochester for over a month. The Nonhuman Rights Project filed its suit on behalf of Happy as a habeas petition back on Oct. 2, but it claims in a new memorandum that the Orleans County Supreme Court has yet to schedule a hearing. “The NhRP respectfully submits that it is entitled to a prompt ruling by this court on whether it will issue the Order to Show Cause so that Happy’s ongoing unlawful imprisonment may be addressed ‘without delay,’” the memo states, signed by the group’s founder and president Steven Wise of Massachusetts. Wise wants the court to decide by Nov. 30, which is the date the court already selected for the other outstanding motions. Wise disputes that the court should drag its feet solely because of the novelty of his claim. Touting Happy as the first elephant to pass the mirror self-recognition test, Wise’s group says that no animal with the cognitive abilities such as those exhibited by Happy should be in a cage. But Wise’s group notes that the Bronx Zoo euthanized Happy’s longtime companion Grumpy in 2002 and separated her around the same time from two other elephants named Patty and Maxine. Happy has lived alone since the zoo euthanized Sammie, the next elephant that became Happy’s companion, in 2006. The Bronx Zoo meanwhile denies that it has been mistreating Happy. It reacted to the habeas petition last month by noting that Happy shows “no signs of physiological or psychological stress,” and maintains a close bond with her caretakers. “The Nonhuman Rights Project is exploiting the Bronx Zoo elephants to advance their own failing cause in the courts as they put forth ludicrous legal arguments and lies about our elephants, facilities and staff,” Bronx Zoo Director Jim Breheny said in a statement at the time. Wise’s group also has brought legal battles to recognize the personhood of chimpanzees Tommy, Kiko, Hercules and Leo, as well as elephants Beulah, Karen and Minnie. New York’s highest court closed the book on the effort to endow chimps with human rights earlier this year. Two months ago Wise’s group also filed an appeal in Connecticut on behalf of the elephants Beulah, Karen and Minnie, which are owned by the Comerford Zoo in Goshen.